Home » Body Mind Healing » October Special – Who Do You Love? October Special – Who Do You Love? We’re delighted to know that you’ve been able to experience a major life-shift or feel like you have reinvented yourself body, mind, and spirit. It may be possible that while you have achieved enlightening transformations, those around you may not be experiencing the same breakthroughs you are. We’ve been in your shoes and we know it’s easier to live a transformed life when you’re surrounded by vibrant energized family and friends! So just for you we’ve created the perfect opportunity for you to share this transformation with them. And right now we’re offering it as a special deal for a limited time. 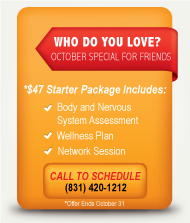 Normally our initial package of a body and nervous system assessment, wellness plan and a network care session costs $150. We are so committed to you living in a transformed community of family and friends we’re offering it for $47. That is an incredible savings for your loved ones. Be sure they act fast though…they must be one of the first 12 people to sign up by October 31st! Send this email to them or have them call us at (831) 420-1212 to reserve their spot. Do it now before all the spaces are gone.